Social media feeds are really delivering the goods on the nature play front. There's three things in particular I can't get out of my head: hummingbirds, pyramids and some super fresh poetry. They resonate as individual items, and together create a powerful, inspiring and achievable framework to bring more nature, simplicity and play into my family's modern urban lifestyle. Hummingbirds first. World renowned nature play advocate Richard Louv recently wrote this article for The Children and Nature Network, an organisation supporting the international movement to connect children, their families and communities to the natural world (of which Louv is Co-Founder and Chair Emeritus). The article draws on writing by Michele Whitaker, guest blogger for The Grass Stain Guru, and discusses caregiver's fear of real and assumed dangers in kid's outdoor play (e.g. lurking strangers, liability, noxious weeds, snakes etc). Parenting can be a tough gig and its not all black and white: to me, the hummingbird offers a helpful middle ground. It acknowledges my parental fears exist and supports me to manage these. It doesn't criticize or inflict guilt. Rather, it encourages me to lift my head to see the bigger picture and gently supports a transition of comfort zones. 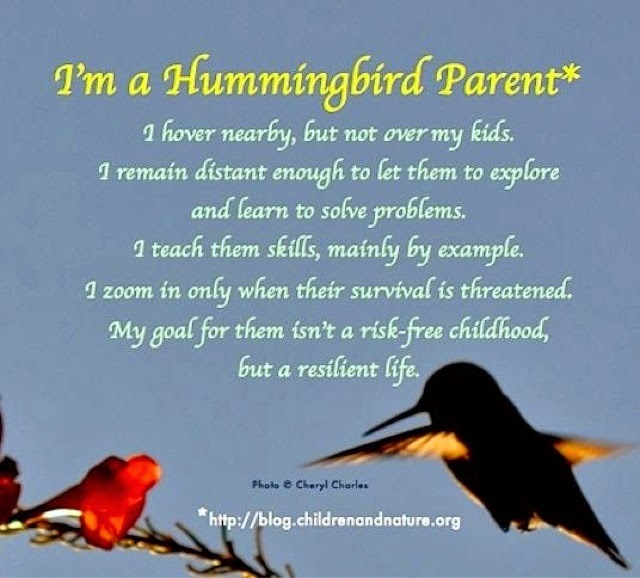 Most importantly however, the hummingbird is one way in which I can support the development of critical life skills in my children. It encourages them to explore, considers their safety within reason, and is adaptable across age cohorts. It ultimately empowers - both me and them - to build their independence and resilience. Now that sounds like a pretty good deal. Next up. Pyramids. Well the Nature Connection Pyramid to be precise. This little gem came through via The Nature Kids Institute, and provides a neat visual strategy for getting kids back outside. You can even get a breakdown on the pyramid components in this five minute clip by award-winning film-maker and Nature Kids Institute Founder Kenny Ballentine. I look at the pyramid and think yeah, I can actually do that. Like the hummingbird it provides a positive, helpful strategy to get kids outside. It highlights a longer-term, big picture goal, breaks it down into achievable steps, and helps me to understand how I can help. 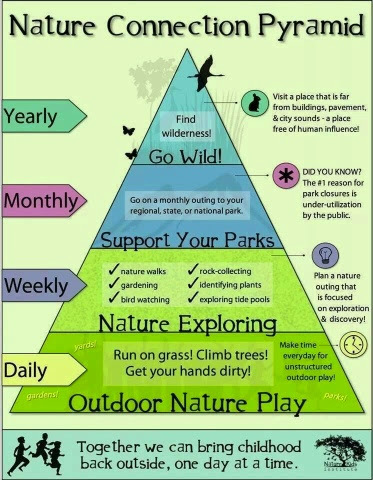 What also strikes me about the pyramid is that it's a good framework to get adults outdoors more too. 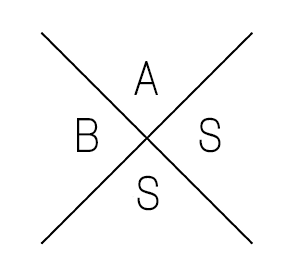 The base looks to be my most challenging component given I run a busy home, work in a city office 4 days a week, and our daylight hours are getting shorter here in the Southern Hemisphere. But as Kenny says, even if its for no more than ten minutes, find time to "frolic". Ten minutes checking the garden, walking tree-lined backstreets to the train, or walking to a city park at lunch I can do. Cheers Kenny! And last but not least. Poetry. 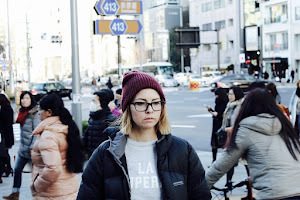 Maybe that word doesn't grab you but seriously, you've gotta take 3 minutes out of your life to check out this impassioned piece of art by acclaimed UK poet Hollie McNish and filmmaker Ben Dowden. Entitled "Hidden Woods", it's breath-taking modern poetry meets nature and its oh so fresh. [Here's the link if the video doesn't come up on your mobile]. Uh huh - hellooooo goosebumps! I'm making this one my anthem, a personal call to arms. I just love the pure craft[wo]manship, and Holly's ability to pinpoint such critical issues in today's society. I'm in awe of how she draws on the past - our childhoods and traditional poetry - and then serves it up as a steaming dish of punchy modern prose. B L O W N A W A Y. What excites me about the above three pieces of work is that they can really help me to build upon this personal commitment to bring more nature, simplicity and play into our family's modern urban lifestyle. Since starting and holding myself to account through nature // street, I'm noticing that it's becoming easier to switch off from the pace, to incorporate more of the outdoors into daily life, to see the magic of the dragonfly moments. The approach is also proving infectious in our family, and my heart pretty much melted on the spot one night this week when my toddler dragged me on to the lawn to lie back and look at the clouds together. I'm going to use the hummingbird, pyramid, and Hollie's poetry to help guide our approach, and have a sense that nature, simplicity and play will soon fall sweetly into the habit or lifestyle category. Bring it on. Over to you for your thoughts. Does the hummingbird, nature connection pyramid or Hidden Woods poetry help or inspire you? Please share in the comment box below! Loved the poem Claire and love your writing - very inspiring! Thanks Peta! Glad you liked the poem and enjoyed the post, thank you!